Want to know what we were busy working on in 2016? If you have enough information to provide a concrete quote, you can use the book-it-now feature to quote on a customer’s job with a fixed price. This will be highlighted in purple and placed above other quotes — putting you ahead of the pack. “Fast Feedback” gives you control over your feedback score so that you don’t have to wait around for customers to leave you a rating. Use the Fast Feedback button on your Quotes tab to instantly leave yourself a review and automatically ask your customer to approve. So much faster! We upgraded our iOS and Android apps to include a new chat feature to make it easier for you to connect with customers. You can exchange instant messages for free through both apps without paying up for text messages or calls. We introduced Compulsory Background Checks for all businesses to ensure that everyone on our platform is legit and you don’t have to worry about competing with dodgy businesses. We created a special Pro membership for our best businesses who want to instantly win their customer’s trust. We cover Pro businesses with a $5,000 workmanship guarantee, on the off chance something goes wrong when you’re on the job. You can now get paid by your customers online, so you don’t have to worry about chasing money you’re owed. We made improvements to your Dashboard so that once you login it’s easier to get a quick overview of new work opportunities. 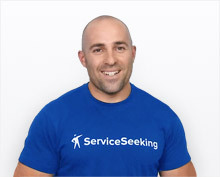 There’s a new Available Leads section where you can view your new job leads and an Announcements call-out where you can find the latest news on ServiceSeeking.com.au (like new features!). We also released new professional looking business pages and better job posting forms to make it easier for customers to let you know exactly what they need done — as well as a stack of other new tweaks and features. We have lots more on the roadmap for 2017, so stay tuned!